"I am attracted by special situations such as an object or scene of extraordinary beauty, often accented by a special light source. Another subject which draws by attention is one which shows the result of something or someone changed by the passing of time, causing the viewer to reminisce about those changes. Catching a subject at just the right moment in time, which is fleeting and may never happen again, challenges me to portray the situation. People interacting positively, having fun together at all ages attract my attention, especially families, the core of civilizations. Finally, what is the best way to present my feelings about these subjects so that the viewer will be drawn into the situation? My faith is a factor in finding these images. I pray for guidance and insight to create the best art possible." Connie's work continues to be juried into fine art exhibits, frequently receiving awards. 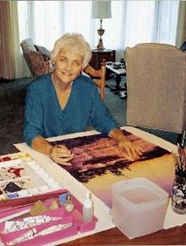 Last year The Hardy Gallery in Ephraim, WI recognized her as an established artist. This spring her work received a Juror's Award at The Hardy, and she was again invited to exhibit in midsummer's show. Her paintings have been juried into the Miller Museum and Gallery in Sturgeon Bay, WI and The Meadows Gallery in Sister Bay, WI in the past year. The PENINSULA PULSE featured Connie's work in the September 12 - 19, 2014 issue. See PPULSE.Com. Her painting 'Sunlit" received an award this December at The Janesville Art League Exhibit in the Janesville Performing Art Center. The Marling Design Center in Janesville is currently featuring her work. Connie was chosen to be the lead artist for the Janesville Rotary Botanical Garden 2014 Fund Raiser. She painted a scene from the garden on a classic Adirondack Chair. Her subject was the Pergola in the Rose Garden decorated for a summer wedding. Constantly seeking new subjects, techniques, and classes with fellow artists whom I admire has led to my acceptance into numerous galleries, art displays, solo shows, awards and signature membership into the Wisconsin Watercolor Society, and Watercolor U.S.A. Honor Society. 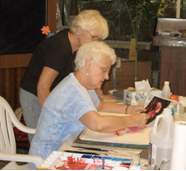 I am also a current member of the National Watercolor Society, Wisconsin Visual Artists, Door County Art League, Janesville Art League, The Hardy Gallery, and P.E. O.